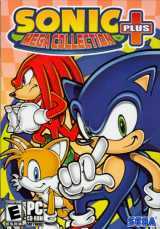 This collection of Sega Mega Drive/Genesis games in the Sonic the Hedgehog series emulated for the PC includes: Sonic the Hedgehog (JP and US versions), Sonic the Hedgehog 2, Sonic the Hedgehog 3, Sonic & Knuckles, Sonic 3D Blast, Sonic Spinball, Dr. Robotnik's Mean Bean Machine, The Ooze, Comix Zone, and these unlockable games - Blue Sphere, Knuckles in Sonic 2, Sonic 3 & Knuckles, Flicky, Ristar. There's also six Game Gear games: Sonic the Hedgehog, Sonic Chaos, Sonic Drift, Sonic Labyrinth, Dr. Robotnik's Mean Bean Machine, and Sonic Blast. It also has new artwork and movies, a new in-game menu, and a mid-game saving feature.